John Amplas began teaching at Point Park University in 1982. 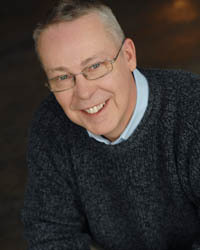 He has taught all levels of acting and directing and has served both as an actor and director in countless productions. He is a founding member of The REP, Point Park University's professional theatre company, as well as its associate artistic director. Amplas has worked Off-Off Broadway in productions of Look Back in Anger and Streamers. He is an accomplished film actor with more than 15 films to his credit, most notably the star in Romero's classic Martin, Tony Buba's No Pets, Brady Lewis' Daddy Cool and a featured role in Melissa Martin's The Bread My Sweet. In collaboration with actor Bill Nunn, Amplas recently developed a Conservatory outreach program that brings theatre to underserved urban schools in and around Pittsburgh, as well as the establishment of the August Wilson Monologue Competition for high school students. The national finals for the competition are held in New York City at The August Wilson Theatre, sponsored by Kenny Leon's True Colors Theatre in Atlanta. The top three national competitors' receive $10,000, $7,000 and $5,000 in scholarship to attend the acting program of Point Park University.